One of Internet marketing’s important questions is whether it makes sense to put a marketing budget toward search engine optimization (SEO), pay-per-click advertising (PPC), or both? You’ll find a mix of opinions on the issue. Some feel that adding PPC when a site is already ranking well organically creates unnecessary expensive cannibalism—paying for clicks that would have come for free through an organic ranking. Others believe in a synergistic effect that PPC has on organic traffic. So what is the right answer? Brad Geddes is a powerhouse when it comes to PPC and gives a great guide to testing the impact of PPC on SEO for any business regardless of size. Testing is essential because the keyword set can impact whether adding PPC helps or hurts the bottom line. In a set of tests on one client, the results showed that adding PPC to organic SEO efforts created a decrease in the number of SEO clicks, but increased the total number of clicks by almost 25 percent. The more important figure is that the total revenue generated by combining SEO and PPC together yielded a profit over 27 percent higher than SEO alone. A recent study by iCrossing found that the addition of organic SEO to a preexisting PPC campaign yielded great benefits (compared to the campaign by itself). 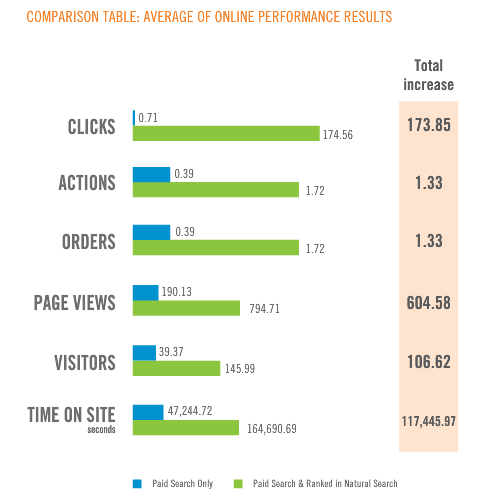 Some addition research by iCrossing shows the impact of running SEO and PPC campaigns together. While the data doesn’t show the relative impact that SEO has on PPC, it seeks to make the case that SEO is complementary to the benefits that PPC provides (while not a complete replacement). A couple of recent tests by George Michie provide some interesting insight into how the SEO vs. PPC dynamic plays out with brand ads. In one test using exclusively branded keywords, some cannibalization occurred, but the ultimate result was synergistic, meaning the total traffic generated from both channels proved to be greater than SEO alone. In a second test performed with a client who had done very little paid advertising, the result of adding PPC was a near complete cannibalization of SEO traffic. In this case, the client ended up losing profits because of the costs incurred by PPC. Does SEO traffic convert better than PPC traffic? One of Geddes’ clients initially performed a test and found that conversion rate differences were fairly negligible between the two traffic channels. Is there a difference between using the same pages you rank for organically as your landing pages for PPC? After all, supposing that conversion rates are same and that cannibalism isn’t a factor, wouldn’t this make combo landing pages a natural strategy? It’s easy to arrive at that conclusion. A test run on Brad Geddes’ client site show the conversion rates when SEO landing pages are used as a destination page from PPC traffic. They also show conversion rates for PPC-specific landing pages. The results are significant. It helps in multiple ways to create PPC-specific landing pages. PPC pages may be simpler, more keyword-targeted, and may even eliminate the traditional page navigation found in a typical SEO landing page. I operate the SEO for a large e-commerce site (planning to become an SEO reseller) that puts a lot of money into pay-per-click advertising, even though we rank #1 for many of the terms we pay for. My observation has been that a sizeable portion of our SEO traffic is tied to our PPC spending, meaning if we scale back our PPC campaigns, we generally see a corresponding dip in our organic traffic. The presence of paid placement in search results as a complement to normal organic rankings is a major trust indicator. If two SERP text snippets both point the searcher to the same site, the “strength in numbers” quality signal increases click-through, regardless of whether one of those is paid. In the new version of Google Analytics, Multi-Channel funnels allow you to see which channel touchpoints your site visitors had during their interaction with your site. One of our largest “funnels” includes site visitors who first came to the site through PPC, then returned later through an organic search result. It’s as if they were first introduced to the brand through paid search (usually through a non-branded keyword), then remember the brand and searched for it then next time. These “initial branding interactions” wouldn’t have taken place without PPC. What Can We Conclude From All This Data? Based on the available studies, it’s safe to say that SEO and PPC work very well together, producing greater results than either would get by itself. There are certainly exceptions to this rule, which is why anyone involved with SEO and PPC is encouraged to test and validate the “synergy hypothesis” rather than blindly believing the studies. Improve SEO entry page URLs: Optimizing specific SEO entry pages from an analysis of keywords that perform well in PPC but struggle SEO-wise from a conversion perspective. Expand SEO priority keywords: High-converting keywords in PPC that are low in organic visibility must become priorities for SEO optimization in order to build the share-of-voice across the search engines. Maximize SEO keyword exposure: Keywords with high PPC conversion rates but high CPC can be targeted in SEO, allowing paid search funds to be reallocated to other keywords. Increase PPC keywords: Keywords that perform well in organic search by either garnering clicks or high conversions provide opportunities for increased exposure through paid search. Minimize expense, more efficient PPC: “First result” organic keywords that are also expensive, high-performing PPC keywords can be deemphasized organically, instead focusing time and funds back into broader PPC keyword sets. Ultimately, decreasing your dependence on SEO or PPC alone will be great for your internet marketing (and help you optimize each channel through data sharing). As long as PPC continues to produce an acceptable ROI, there’s no reason to shut it off. And since most clicks on a search result page are given to organic results, the best viable strategy is to constantly work toward high organic placements via SEO.